I made a mistake with the dates of the Michigan and Wisconsin polls yesterday and made a rare midday correction. 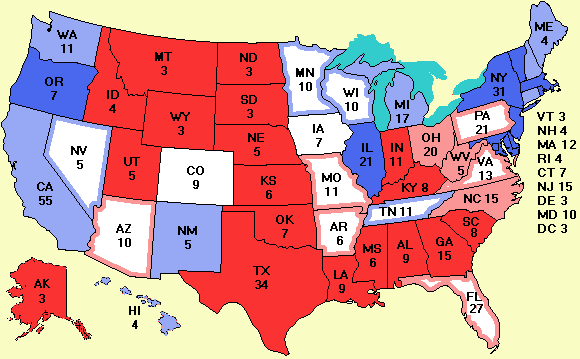 The most recent polls in those states are the Lake Snell Perry polls, a day later than Strategic Vision. Sorry for the confusion. A new poll in Missouri has Bush still ahead in this critical state. His lead is 49% to 45%. His lead in Texas is a whopping 24%. Nader news: We have decisions or rulings in eight states affecting Nader. He qualified in Kansas, Connecticut, Washington, and Wyoming. He failed in Massachusetts, Oregon, Michigan, and Texas. Two of those matter: Oregon and Michigan will probably be close. Senate news: The first poll on the Castor-Martinez Senate race is in. Hamilton-Beattie (D) puts Castor ahead 48% to 44%. That race will attract a lot of attention. A new poll is also in for the South Dakota Senate race. Tom Daschle is at 53% vs. John Thune's 45%. This one is especially bitter because long-standing tradition in the Senate is not to attack the other side's leader and the Republicans have violated that and are going all out to defeat Tom Daschle. It is a bold, risky strategy. Unlike the House, where if you have 218 votes you can ram anything you want through, in the Senate you need 60 votes to invoke cloture. If the Republicans make the Democrats mad enough, even if Bush wins and the Republicans hold the Senate, the Democrats can easily tie the Senate in knots and prevent Bush from achieving anything. Bill Frist is not up for reelection this year. If you want to participate in a mock election, take a look at us-election.com. It allows people anywhere in the world to vote in the U.S. election. It is interesting to see how the rest of the world views the candidates. And, boy, do they have a lot of candidates available. Probably you know about Bush, Kerry, Nader, Cobb, and Badnarik, but that's less than half.